Objective: Patients with Medtronic implantable devices were evaluated addressing both clinical and nonclinical aspects. An observational, prospective study compared patients in the CareLink arm (active) to Non-CareLink arm (control) in patients with Medtronic implantable devices presenting to the emergency department. Materials and Methods: Data was collected from a community hospital ED (South Lake Hospital – Lake County, FL) over 12 months. Fifty patients were enrolled in the study. Data sources included health records, implant reports, initial demographic data collection and questionnaires. 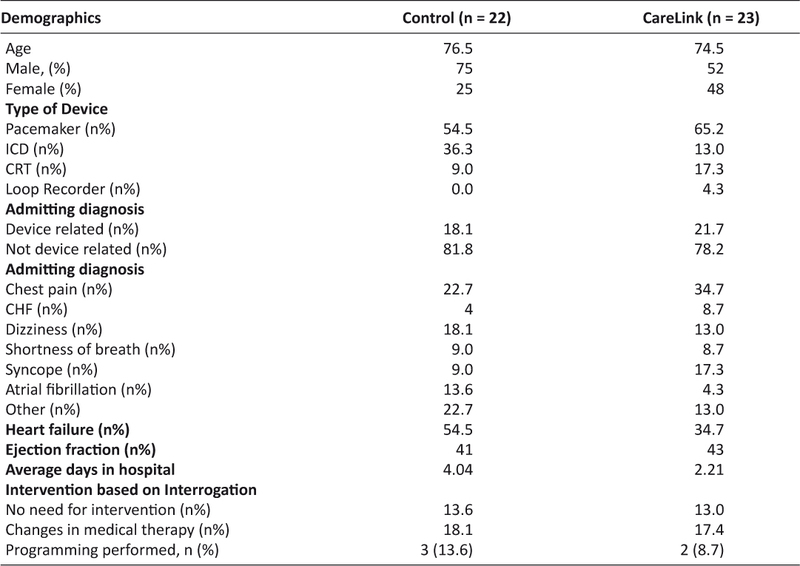 Results: Length of hospitalization was longer in the control group than in the CareLink group (4.04 vs. 2.21 days). Notably 91.3% of physicians preferred the use of CareLink Express over standard interrogation methods. Patients reported shorter wait time for device results with CareLink Express and “felt less anxious” compared to standard interrogation methods with corresponding p-values of 0.009 and 0.01. Control group arrival to interrogation time ranged from 91-3,022 minutes while the CareLink group ranged from 18-1,551 minutes. Significantly less time was required for interrogation in the CareLink group (422 min) than that of the Control group (1150 min, p < 0.001). Discussion: Our data indicates that express monitoring technology using the CareLink Express system provides a satisfactory and expedient alternative to programmer interrogation. Conclusion: The current process of device interrogation requires a company representative to come to the ED assess the patient’s device. Depending on representative availability this can be a time-consuming process, especially in rural settings. The CareLink Express reduces interrogation times significantly. The 2009 world survey of cardiac pacing and implantable cardiac defibrillators (ICD) showed that there were 1,002,664 devices implanted of which 737,840 were new implants and 264,824 were replacements (ref 1). The United States of America (USA) had the largest number of cardiac pacemaker implants (225,567) and Germany the highest new implants per million populations (927). The survey also involved 328,027 ICDs, with 222,407 new implants and 105,620 replacements. Virtually all countries surveyed showed a significant rise in the use of ICDs with the largest implanter being the USA (133,262). In the USA, increased healthcare expenditures are of significant concern. This has put pressure on the healthcare system to change the way hospitals and physicians are reimbursed for their services. One solution has been to replace the traditional fee-for-service model with a new pay-for-performance model where compensation is tied to meeting quality measures and payments to hospitals and providers are bundled to align their financial interests. In this new model, the emergency department (ED), being the front door to the hospital, has the first and most critical opportunity to influence both patient perception of care and clinical quality. In October 2012 (FY2013), hospitals were assessed based on their performance in both of these areas. At that time, the Center for Medicare and Medicaid Services (CMS) began calculating hospital reimbursement based on their performance in 17 core measures (70 percent) and Hospital Consumer Assessment of Healthcare Providers and System (HCAHPS) survey results (30 percent). Additionally, the American College of Emergency Physicians (ACEP) recognized the importance to educate physicians about working closely with hospital administrators to utilize patient satisfaction surveys, as this may result in better outcomes and improve reimbursement for their facilities.2–4 Although CMS’s pay-for-performance measures only use HCAHPS scores from inpatients, there is a strong correlation between ED performance and overall hospital performance. CMS began collecting data on two ED metrics on January 1, 2012: median time from ED arrival to admission (patient leaves the ED to go to the inpatient room) and the ED median time from the physician’s admission decision to when the patient leaves the ED to enter the inpatient room. In general, these surveys reveal that hospitals with highly ranked Emergency Departments perform well on inpatient HCAHPS surveys. Moreover, hospitals whose EDs are rated poorly by patients tend to perform poorly on HCAHPS surveys. The increasing role of remote monitoring has improved the follow-up of patients with implantable devices among clinical and economic outcomes. A recent observational study evaluated outcomes in both clinical (event detection and time to diagnosis) and nonclinical (patient’s satisfaction and economic costs) aspects among office patients utilizing the CareLink Express System (Medtronic, Minnesota).5 This small observational, longitudinal, prospective study was conducted with patients from a Portuguese central hospital sampled during 1 week (43 patients). Data was collected at four different times: two in-office visits and two remote evaluations, reproducing one year of clinical follow-up. Data sources included health records; implant reports, initial demographic data collection, follow-up printouts, and a questionnaire. Clinically, 15 events were detected (9 by remote monitoring and 6 by patient-initiated activation), of which only 9 were symptomatic (p = 0.028). Moreover, the mean diagnosis anticipation in patients with events was approximately 58 days (p < 0.001). Although researchers observed high patient satisfaction (67%) with using remote monitoring technology, still 8 patients (53%) stated that they preferred in-office visits. When patients present to the emergency department with a history of a Cardiac Implantable Electronic Device (CIED), the emergency room personnel often request a prompt evaluation of the device for diagnostic and therapeutic purposes. This interrogation procedure frequently requires a specialized technician to assess the device function. The process is time consuming for both the patient and the healthcare staff, therefore increasing costs and decreasing patient satisfaction. We evaluated the utility of the CareLink Express™ (Medtronic, Minneapolis, MN) Service remote monitoring system by comparing its use in patients with implanted devices presenting to the emergency department to patients treated using standard support. In this trial, we hypothesized that prompt intervention in the CareLink arm will result in improvements in patient and physician satisfaction. We also hypothesized that CareLink will reduce device interrogation latency, which would indirectly improve financial outcomes by facilitating disposition in the ED, time to diagnosis, and/or reduce the length of hospital stays. This is an observational, prospective, longitudinal study. The study protocol was submitted to an expert panel for validation of the methodology and of the questionnaire applied during the investigation. The protocol was approved by the Institutional Review Board at Orlando Health in Orlando, Florida. All participants gave informed consent prior to participation in this study. The population was sampled by convenience among all patients with an implanted pacemaker, defibrillator (ICD), loop recorder or cardiac resynchronization device (CRT) who presented to the Emergency Department at South Lake Hospital between April 2014 and April 2015. Study participants were required to provide informed consent and have a Medtronic CIED. Patients with a Medtronic CareLink Express implantable device were placed in the CareLink arm. The equipment for device interrogation was provided by the manufacturer, with no associated costs for the hospital or the patient. Transmission over the phone line was also provided by the manufacturer at no cost. Beyond socioeconomic data, the following clinical data was considered: type of implanted device, generator model, implant date, cause of admission, time to interrogation. Finally, questionnaires were distributed and measured with results based on a 5 point Likert scale to assess level of comfort, ease of use, physician satisfaction, and patient satisfaction (1= strongly agree, 2 = agree, 3 = indifferent, 4 = disagree, 5 = strongly disagree). The Physician Questionnaire inquired about the following: how helpful was CareLink in your evaluation, did it improve decision-making, was monitor set-up easy, was there overall satisfaction with CareLink, would the provider use CareLink again, and lastly, does the provider prefer CareLink to the use of the Medtronic Programmer. The Patient Questionnaire inquired about the following: did the healthcare staff provide an explanation of your plan of care, was there short wait time in exam room, was there short wait time for device results, was there short wait time for ED physician diagnosis/decision, did the experience reduce anxiety, and what was the overall satisfaction with the visit. The scale for the patient questionnaire was scored so a lower number indicated increased satisfaction. Data collection was performed in the emergency department at South Lake Hospital (Lake County, FL). Data was obtained by consulting the patient’s health record, implant report, initial socioeconomic data collection and the questionnaire administered at the initial evaluation. Mean values were calculated from the physician and patient questionnaires. These mean values revealed differences in quality, patient and physician satisfaction as well as clinical parameters. A Student T-test was also applied to the collected data to determine if these differences were of statistical significance. We identified 50 potential patients with Medtronic devices who were randomly assigned to the control group or CareLink group, 5 of which were not included in final statistical analyses due to incomplete data. Patients with CareLink devices were randomly assigned to either group while patients with other Medtronic devices were placed in the control group (as their devices are not compatible with CareLink software). Table 1 identifies baseline characteristics and patient demographics in each arm. The mean age of the study groups were 76.5 for the control group and 74.5 for the CareLink group. On average, there was a larger number of female patients (23) and patients with pacemaker devices (10.8%) who were placed in the CareLink group. There was no major difference identified between the two groups in regard to admitting diagnosis with the majority of patients presenting with non-device related events, chest pain being the most frequent (22.7% in control group and 34.7% in CareLink group). Significantly more patients in the control group (54.7% vs. 34.8%) presented with an established diagnosis of heart failure. However, there was no significant difference in baseline ejection fraction (0.41 vs. 0.43). On average, the control group’s length of hospitalization was significantly longer than that of the CareLink group (4.04 vs. 2.21 days), likely due to the higher percentage of patients admitted for heart failure in the control group. Five total patients had reprogramming of their implantable cardiac device after initial interrogation, of which three (13.6%) were from the control group. Physician assessments of ease of use and satisfaction are depicted in Figure 1. There were no statistical significances drawn from the two groups, as physician satisfaction was not collected in the control (standard) group. In all measured categories clinicians were reported to strongly agree with all categories indicating overall satisfaction with the performance of the interrogation techniques. The results were significant as physicians “strongly agreed” in all measured categories, including 91.3% of physician’s who preferred the use of CareLink Express to that of standard methods with a Medtronic Programmer. Patients ease of use and satisfaction are depicted in Table 2. These values were compared between the control and CareLink groups. Student t-test analysis revealed two statistically significant areas showing clear benefit with use of the CareLink Express Remote Monitor, “Short wait time for device results” and “feeling less anxious” with corresponding p-values of 0.009 and 0.01. The clinical relevance of this data is hard to predict, as patients could not have participated in both groups to have an accurate comparison. Those that have experienced device interrogations prior to this study may have contributed to the data showing a reduction in anxiety and wait time with the CareLink Express. The economic analysis was driven by the “arrival to device interrogation” time between the two groups, depicted in Figure 2. The rationale supporting this is CMS using median time from ED arrival to admission (patient leaves the ED to go to the inpatient room) and the ED median time from the physician’s admission decision to when the patient leaves the ED to enter the inpatient room as quality metrics for emergency departments. Reducing arrival to device interrogation times would help improve both metrics by giving physicians data about the patient earlier in their visit. Control group arrival to device interrogation times ranged from 91-3,022 minutes while the CareLink group ranged from 18-1,551 minutes. Less time elapsed before interrogation in the CareLink group 422 min (SD 489) than in the Control group 1150 min (SD 792), a statistically significant difference (P < 0.001). 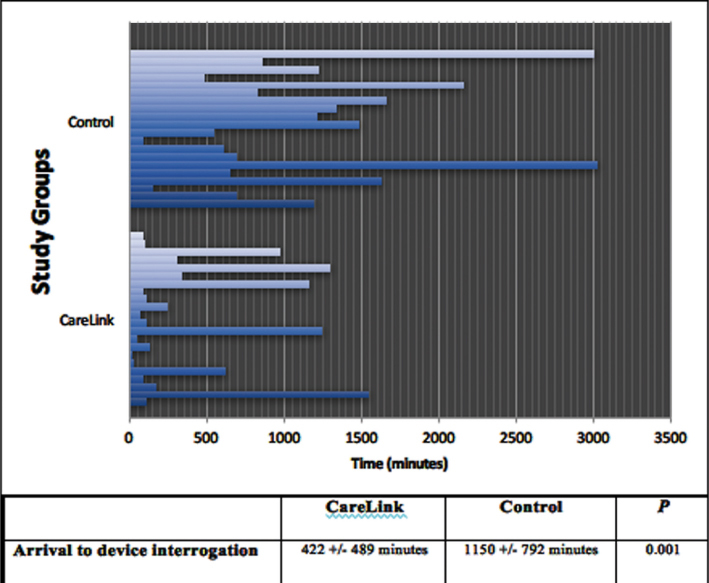 Furthermore, because of the CMS metrics and physician satisfaction with the CareLink System, this reduced time to device interrogation has clinical significance as well. Further economic analysis was limited by the sample size and multiple other variables associated with financial data collection, making it difficult to extrapolate any further conclusions from the overall data. The main limitation is the small sample size. The sample may have included patients who may have never visited the ED before, so their expectations were not comparable to any past experience. Similarly, patients did not serve as their own controls, so it was difficult to compare one patient’s experience to another from a patient quality perspective. Patients who have had previous experiences with their condition in the ED likely provided the most useful data in our group, but it was unclear how many in our sample had previous emergency department experiences for this condition. The survey design of this study was weakened by the time patients spent in the ED between shifts. The survey was completed by the last physician who saw study participants in the ED, who may not have fully appreciated the amount of time patients have spent in the ED. Another limitation is the lack of financial data under the new Medicare bundled payment program. With more financial data, an accurate economic analysis of this product could be performed. Additionally, ED data about patient volumes and average wait times for this presentation could be another foundation for data analysis to assess the productivity improvements with such a device. Our data indicate that remote monitoring technology with CareLink Express Remote Monitor system provides a safe, practical, and cost-effective alternative to time-consuming, device-dependent programmer interrogation. The system was easy to use and both the patients and hospital staff were satisfied with it. Physicians preferred use of the CareLink Express Remote Monitor when available. This study demonstrates that the CareLink Express system identifies areas that need improvement in both clinical and nonclinical aspects of care. Our results indicate that there is no statistical difference in diagnosis of arrhythmia- or device-related issues, provided that the technology works seamlessly and transfers the same information that is generated with a Medtronic programmer device interrogation. We found statistically significant differences in the distribution of the variable mean time to device interrogation between the two groups. While no definitive economic analysis could be established, the overall ED patient wait times would drastically be reduced with use of this system and likely generate cost effectiveness due to improved turnover of patients in the ED from reduced time to interrogation. The authors of this study would like to thank Arnold M. Einhorn, MD and Jeffrey Fitch, MD for their guidance and support for this study. Medtronic, Inc. was the funding sponsor for this study. 1. Mond, H. G., Proclemer, A. The 11th World Survey of Cardiac Pacing and Implantable Cardioverter – Defibrillators: Calendar Year 2009–A World Society of Arrhythmia’s Project. Pacing and Clinical Electrophysiology. 2011;34(8):1013–1027. 2. Glickman, S. W., Schulman, K. A., Peterson, E. D., Hocker, M. B., Cairns, C. B. Evidence-based perspectives on pay for performance and quality of patient care and outcomes in emergency medicine. Annals of Emergency Medicine. 2008;51(5):622–631. 3. William, J., DesRochers, L., Enguidanos E., Fite, D., Fitz, J., Freess, D., Sharma, A. Patient Satisfaction, An Information Paper. American College of Emergency Physicians: Emergency Medicine Practice Committee. 2011. 4. Heidbüchel, H., Lioen, P., Foulon, S., Huybrechts, W., Ector, J., Willems, R., & Ector, H. Potential role of remote monitoring for scheduled and unscheduled evaluations of patients with an implantable defibrillator. Europace. 2008;10(3):351–357. 5. Costa, P. D., Reis, A. H., & Rodrigues, P. P. Clinical and economic impact of remote monitoring on the follow-up of patients with implantable electronic cardiovascular devices: An observational study. Telemedicine and e-Health. 2013;19(2):71–80. 6. Kallinen, L. M., Hauser, R. G., Tang, C., Melby, D. P., Almquist, A. K., Katsiyiannis, W. T., Gornick, C. C. Lead integrity alert algorithm decreases inappropriate shocks in patients who have Sprint Fidelis pace-sense conductor fractures. Heart Rhythm. 2010;7(8):1048–1055. 7. Volosin, K., Stadler, R. W., Wyszynski, R., Kirchhof, P. (2013). Tachycardia detection performance of implantable loop recorders: results from a large ‘real-life’ patient cohort and patients with induced ventricular arrhythmias. Europace. 2013;15(8):1215–22. 8. Santini, M., Ricci, R. P., Lunati, M., Landolina, M., Perego, G. B., Marzegalli, M., Valsecchi, S. Remote monitoring of patients with biventricular defibrillators through the CareLink system improves clinical management of arrhythmias and heart failure episodes. Journal of Interventional Cardiac Electrophysiology. 2009;24(1):53–61. 9. Bikou, O., Licka, M., Kathoefer, S., Katus, H. A., & Bauer, A. Cost savings and safety of ICD remote control by telephone: a prospective, observational study. Journal of Telemedicine and Telecare. 2010;16(7):403–408. 10. Varma, N., Epstein, A. E., Irimpen, A., Schweikert, R., Love, C. Efficacy and safety of automatic remote monitoring for implantable cardioverter-defibrillator follow-up the Lumos-T Safely Reduces Routine Office Device Follow-Up (TRUST) trial. Circulation. 2010;122(4):325–332. 11. Crossley, G., Boyle, A., Vitense, H., Sherfesee, L., Mead, R. H. Trial design of the clinical evaluation of remote notification to reduce time to clinical decision: The clinical evaluation of remote notification to reduce time to clinical decision (CONNECT) study. American Heart Journal. 2008;156(5):840–846. 12. Akar, J. G., Bao, H., Jones, P., Wang, Y., Chaudhry, S. I., Varosy, P., Curtis, J. P. Use of remote monitoring of newly implanted cardioverter-defibrillators: insights from the patient related determinants of ICD remote monitoring (PREDICT RM) study. Circulation. 2013;128(22):2372–83. 13. Klersy, C., De Silvestri, A., Gabutti, G., Regoli, F., & Auricchio, A. A meta-analysis of remote monitoring of heart failure patients. Journal of the American College of Cardiology. 2009;54(18):1683–1694. 14. Volosin, K., Stadler, R. W., Wyszynski, R., & Kirchhof, P. (2013). Tachycardia detection performance of implantable loop recorders: results from a large ‘real-life’patient cohort and patients with induced ventricular arrhythmias. Europace, eut036.